Rehearsal dinner invitation etiquette is a quick guide on who to invite and how to invite guests to your wedding rehearsal dinner. It is a good time to bring everyone together for a little fun and casual conversation. Traditionally rehearsal dinner etiquette has the groom's parents hosting this dinner However, more modernly, anyone can host a rehearsal dinner, even the bride and groom. Whoever the host, a rehearsal dinner should be a time to relax and give everyone an opportunity to enjoy themselves. Who should be invited? Rehearsal dinner invitation etiquette is so much more relaxed than wedding etiquette. It is truly left to the discretion of those hosting the dinner and the bride and groom. As it is the rehearsal dinner, the parents of the bride and groom, the wedding party and their spouses or significant other and the person officiating the wedding. If you have guests coming in from out of town, they can be invited as well. 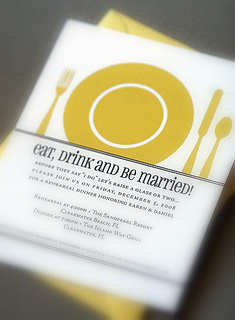 Before you send the invitations, the type of dinner you will be hosting should be planned out. If the dinner is to be formal, then the invitation would be formal, and mailed out 4 weeks in advance. A casual dinner does not require as much. Please join us in celebrating the wedding of Kaden and Michelle for a rehearsal dinner at 7:30 on Thursday May 21st, 2010. The dinner will be at the Woodruff's home 2030 East 3895 South Sugarhouse, Utah. If the dinner is casual in nature, rehearsal dinner invitation etiquette allows for no formal invitations to be made and sent at all. It is truly acceptable to invite via word of mouth, email, phone call or text. Just make sure the guests know the location, date and time of the event. The rehearsal dinner is a wonderful break in the midst of all of the wedding ado. Take the time to relax and enjoy yourselves for an evening. The next day gets a little (or a lot) crazy.